Disclaimer: Movies listed here are a mix of movies that might possibly have influenced Tarantino in making this movie (so those are guesses) and movies that are directly or indirectly referenced to or more or less openly paid hommage to by Tarantino (such as "Django" obviously). One of the Wanted posters on the wall in the film is for Edwin Porter. Porter was an early film pioneer and the director of the classic Western The Great Train Robbery (1903). The word MISSISSIPPI scans across the screen in large letters — a reference to the infamous credit sequence of Gone With the Wind, a film that did a lot to help mythologize (and whitewash) the world of the southern antebellum plantation. Dr. Schultz' horse Fritz is inspired by Roy Roger's Trigger who often did tricks. The films he was in were directed by one of QT's heroes William Witney. Actor Russ Tamblyn who plays "Son of a Gunfighter" starred in the cult 1965 Western Son of a Gunfighter. 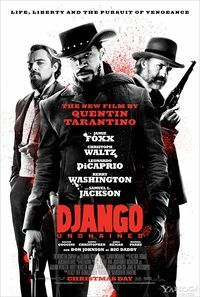 His daughter, Amber Tamblyn is credited as playing “Daughter of the Son of a Gunfighter" in Django Unchained. Dr. King Schultz may be named after Doc Schultz (Dub Taylor) a character in the Western comedy Support Your Local Gunfighter. The comical Regulators scene in the film is a direct reference to D.W. Griffith's The Birth of a Nation in which KKK members wore hoods during a raid on black citizens. Jim Croce's song "I Got A Name" was originally featured in the 1973 moonshiner/race car film The Last American Hero. Dog Gone South 1950s cartoon. Quentin attached it to the Django Unchained print screened at the New Beverly Theater. 1975 film starring Ken Norton. A term for an African slave/fighter in the 1800s. A very controversial mondo film about slavery in the Antebellum South. 70s Blaxploitation film starring Fred Williamson that dealt with a slave who gets back at white oppressors. Film about an ex-biker gang member who helps some hippies fight a group of rednecks that terrorize their peaceful commune. Don Stroud who plays Sheriff Bill Sharp starred in the film. Lee Horsley who plays Sheriff Gus was the star of the 80s private eye series Matt Houston. Don Johnson who plays Big Daddy was the star of the hit 80s crime series Miami Vice. Tom Wopat who plays U.S. Marshall Gill Tatum was Luke Duke on The Dukes of Hazzard. In another connection that series also featured QT's acting teacher James Best as Sheriff Roscoe P. Coltrane. The Cleopatra Club, a place for interracial couples, is named after the Egyptian queen. One of the slaves is named D'Artagnan, who is also the main character in Alexandre Dumas' book The Three Musketeers. The woman in Candie's home plays a song by Beethoven, (a famous German) on the harp. This page was last edited on 28 November 2017, at 21:12.